While swimming pools are a great way to stay cool and encourage kids to stay active during summer vacation, they are also a major safety concern for parents. Even shallow pools can be dangerous if the proper safety measures have not been set. The best precaution to take when it comes to kids and swimming safety is to provide adult supervision at all times. You might even consider becoming CPR certified. While classes can vary in cost, there are usually local classes available and the ability to act quickly in an emergency situation could save your child’s life. There are steps you can take to help promote swimming safety before allowing your kids to enter your backyard pool. Install a climb-proof fence around the pool with a self-closing gate and a childproof lock. Having such a fence will help to ensure that your kids or pets will not accidentally fall into or purposely enter the pool when an adult is not present. Set time limits and rules for your children and their friends. Insist that swimmers wear sunscreen and that younger children also wear life jackets, even if they already know how to swim. Teach children not to play with filters or hoses and to always use the designated entry ladder and never to climb over the sides. 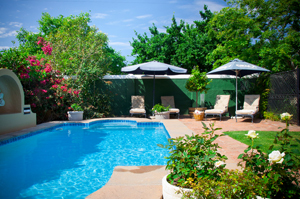 When cleaning your pool, be sure to clean the surrounding area as well. If your pool has a built-around deck, remove any tripping hazards and check to make sure that railings are secure. Double check to make sure that any lighting or wiring is not within a potential splash area. If your pool has built-in lighting or other electronic components, be sure these are well maintained and checked each season. After cleaning, store chemicals in a locked area, such as a shed or garage. This blog is one of a series on summer safety for children. We understand that not all homeowners are as vigilant as you when it comes to your child’s safety. If you or your child has been injured due to another homeowner’s negligence, talk to an experienced attorney. Contact KBG to discuss your possible options, and get the Results You Deserve®.